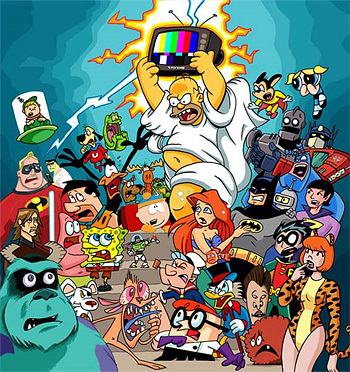 How many of these characters can you name? Animated Shows originating in North America, Western Europe, Australia or New Zealand. Some of these entries are actually compilations of theatrical shorts assembled for broadcast; the vast majority, though, are original creations made for television. These are frequently Dom Coms (The Simpsons, Family Guy, The Flintstones) or Adventure Series (Jonny Quest, Justice League), and generally follow the conventions and Tropes of their genre (and may exaggerate them). Note that during the 1970s, many primetime series both current and cancelled acquired animated versions broadcast as part of the network's Saturday morning kidvid block; The Ricky Gervais Show many of these are noted in the entries for the live-action show. For non-Western animation, see Asian Animation and Eastern European Animation. Animated shows have developed their own dialect of cliches and devices; see Animation Tropes for a listing. Pages in category "Western Animation"
The following 200 pages are in this category, out of 1,366 total. This page was last edited on 14 June 2015, at 07:17.